Holly Weller during her miraculous journey. This passage from Sunday’s first reading from Acts (Acts 2:42-47) describes the mood of the first witnesses to the glory of the risen savior. 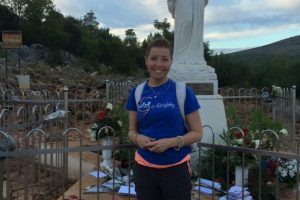 The same words could also describe the mood of a group of 21st century pilgrims who recently journeyed to Medjugorje to witness their own miracle. What they were hoping to see at this site (whose name they couldn’t even pronounce) in Bosnia-Herzegovina, and what they actually experienced, may be two different things—but the results were no less miraculous than those made possible in people’s hearts by the acts of the first apostles. The journey of seven pilgrims to Medjugorje was captured in the film Apparition Hill. These seven people won a free trip to this site of the Virgin Mary’s 1981 appearance to several witnesses, some of whom claim they still see Mary on a regular basis. Being a true doubting Thomas, I believed this film to be a possible scheme by its producers to miraculously make its audience’s money disappear. After seeing it, though, I’m convinced the experience of these pilgrims—a couple of them self-professed atheists—matches the truth of the risen Lord that those early believers found in each other. Yes, these seven were suffering their own trials, but throughout this trip they found the healing consolation of each other’s spirit. Upon their return home, the atheists still had questions about the reality of Marian miracles at Medjugorje, and Holly still had to make her final preparations for death, but they ultimately found the promise of a miracle in the new holy family they found on their pilgrimage.